[Host:] All right, contestants, you’ll be playing for one of two delectable dog treats. I will hide one of the treats in my right hand, and the other in my left. Your mission is to guess the hand with the treat. Ready? [Host, with grave concern:] You do understand that once time runs out, you cannot change your guess? See? Everybody wins, everybody eats, everybody is happy. That’s how it would be if Corgis could develop game shows. The days are getting longer. It is time to shed. 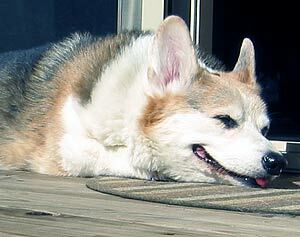 Being a Corgi, I shed all the time, but it is time to free myself of a winter coat. I do this by shooting out big tufts of fur instead of just dropping individual hairs. It makes me look weird for a while, but soon I will feel light and fancy-free. And that's the way it should be. Do you smell that? 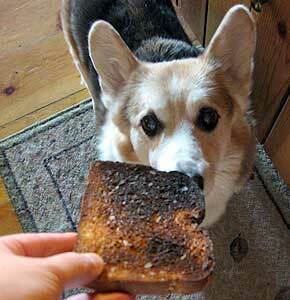 That is the delectable scent of the toaster staying on a little bit too long. Mmmm, charcoal. And that, my friends, means Dog Toast. See if you can guess what happens next. Today is my birthday! Yay! My present was my very own dog park! Well, kinda. My folks fenced off a big portion of our large side yard just for us. The workmanship is the very definition of “amateur,” because it is just a big roll of plastic garden mesh hung on those metal fence posts, which are stuck partially into the ground. It’s temporary until real landscaping magically happens (we all know if it happens on my folks’ watch, it has to be magic), but it works for us. We have been running around at top speed all afternoon. We will sleep tonight. In fact, I hope I can stay awake long enough for cake! It has been stormy and rainy for many days. Today it finally cleared up and we don’t have to be cooped up inside. This morning we went to our new favorite park. We walked and walked, which made us tired. When we got back home, we decided that a nap was in order. Being a beautiful day, an outdoor nap was called for. It is wonderful to sleep in the sun. And I always have looked marvelous with my tongue sticking out.